Another Trevor collection of short stories is always good news, and here in these 12 tales (many previously published in The New Yorker), the author again attends to the usually sad, small defeats of victims caught in the consequences of distant searing events, betrayed by their own wrong turns or, worse, simple inadequacy. 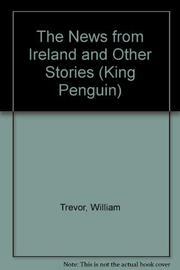 In the title story, set in Ireland in 1847-48, a dry leaf of a "poor Irish" Protestant butler acts as a kind of persistent guide and prophet to the poverty, starvation, misery and horror of the ravished Irish countryside outside the English-occupied estate of a blandly oblivious, newly arrived English family. The soul he would turn back to England is the governess, a young woman of "principle and sensibility," another in a long line of Ireland's "visitors and strangers." Will she listen? Yes, reluctantly, and she'll be "sick at heart." But like her employers and other destroying strangers, she will, by the close, "learn to live with things." Joureys to times past bring illumination but also loss. In "Virgins" two middle-aged women meet in Italy, too late to ever find again their joyous girlhood friendship in Ireland--drawn apart long ago by the feverish wiles of a dying boy. Yet "that friendship. . .ran deeper than [their] marriages." Torment for torment is the destiny of a young hotel-heir who discarded his lover because of caste and cowardice; and in "On the Zattere," an elderly widower and his daughter, the latter wasted by a self-serving lover, are trapped in a stasis of silent anger. Love is elusive: "Mr. Robin Right" is always just around the corner for an aging chorine; and in Florence, a middle-aged woman disappears (probably dead), and the man she desired, hopelessly impotent, muses on their "affair": "She had arrived at the happiest moment of love, when nothing is destroyed." The dream lies forever out of reach; one simply "settles"; and parents doom children to fear and hatred. As always, Trevor, the consummate storyteller, writes with skill and compassion as he scrupulously weighs the press and passions of time and event on restless lives straining after illusions--or held by the potency of an evil never fully understood.